Available as a digital download. Interviews with Paul McCarthy and Darryl Sapien. Profile of LaMamelle, San Francisco. 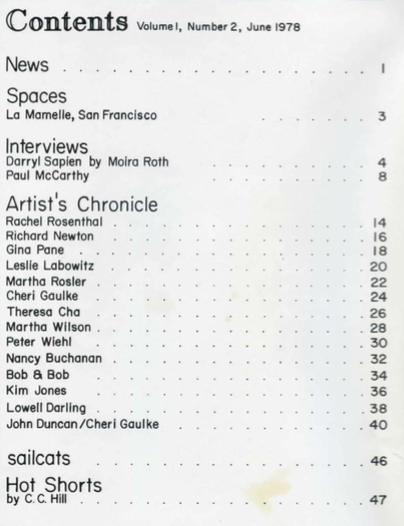 Artist’s Chronicle: Rachel Rosenthal, Richard Newton, Gina Pane, Leslie Labowitz, Martha Rosler, Cheri Gaulke, Martha Wilson, Kim Jones, Lowell Darling, John Duncan and more.